| Welcome good dating profile words ! Posted On June 12, 2018 at 5:03 pm by	Dominic Maratta / Comments Off on Should picking a wedding band be a difficult decision? We are here to tell you there is no right or wrong answer! Let’s talk about options and how to find the best pairing! Women get really overwhelmed while picking their wedding bands because there really are so many options. 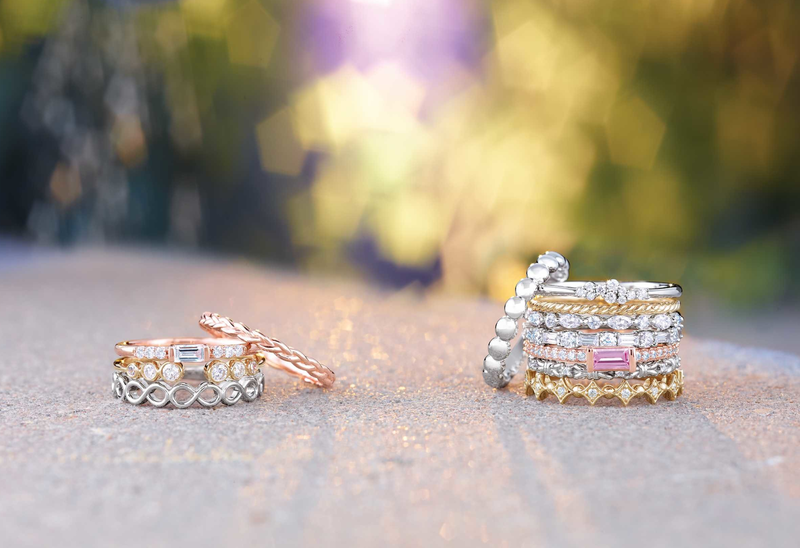 Especially with the “stackable” wedding band look that is now trending! We believe at Dominic’s Fine Jewelry before you start to shop for your wedding band, it is important to decide if you are going to wear your wedding band with your engagement ring or wear your wedding band alone. If you like to stack your wedding band and would like to build a cohesive stack you should consider that some engagement rings are not ideal for stacking. Some engagement rings do not have a flat edge, such as a twisted band or spilt band it may be a little harder to find something that sits completely flush against your engagement ring. We can come up with different and fun ways to make a wedding band look accommodating with your engagement ring. If you’re not looking to customize a wedding band that will sit flush with your engagement ring there are other options that we can manipulate to look accommodating to your engagement ring. For instance, if you go with something more unique such as a twisted or cross over wedding band this brings a fun and trendy look to your stack. There may be a small space that you may have to embrace between your engagement ring and wedding band. Dominic’s Fine Jewelry believes that the fun part about the wedding band is that it really can set your wedding set apart from others that may be similar to yours. You may have a solitaire or pave engagement band, but when you start building your wedding band stack, that’s when it really comes unique to you! We love to create texture in our stacks wedding bands that are thinner or thicker from your engagement ring so there is variation in your overall look. When picking two wedding band you can go with the same or similar style and stack them under your engagement ring! If your thinking of larger band, something more substantial you should definitely try it on with your engagement ring, if your planning to wear as a pair. Sometimes bigger diamonds on your wedding band can take away from your engagement ring, and we don’t want that to happen. 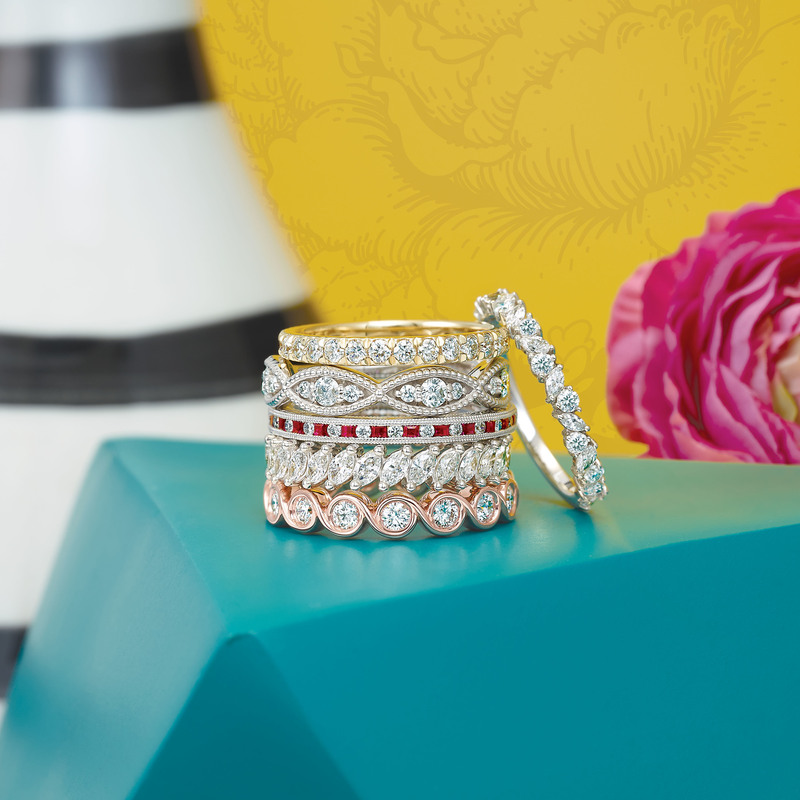 Your engagement ring should be the star of the show and your wedding band should compliment your engagement ring. Sometimes adding just little bit of something extra to your engagement ring is exactly what you are looking for. So, in this case, bigger isn’t always better when it comes to your wedding band. When picking your wedding band, you shouldn’t get too overwhelmed by the choices, instead pick your favorite for now. Adding to your engagement ring or your wedding band stack on a later date is a great gift option for birthdays or 1st anniversaries. Adding different metals such as yellow gold band or adding birthstones of your spouses to the band, these elements add different dimensions to your stack. When figuring what shape stones to use in your wedding band people often like to choose to match the shape of stones that is in their engagement ring. Example, if you have round pave in your engagement ring, people often tend to pick round stones in their engagement ring. There is no right or wrong answer you can wear whatever you please. In terms of value, rounds will be your best bet because rounds are much easier to manufacture and match the quality of the round stones in smaller carat weights. In other fancy shapes such as princess, in small carat weights you will not get the full effect of those shapes in the wedding band like you do in round band. There are so many different options in wedding bands! Dominic’s Fine Jewelry has a great selection of wedding bands that you can try on and make sure you love with your engagement ring or maybe without! If you can’t find the perfect pairing, we would happy to sit down with your and give you design consultation to create something just for you! At the end of the day there is no right or wrong to this it is just about you love!